On March 22 one of the most lucrative award charts will devalue: American Airlines. After American and US Airways announced their merger, it was only a matter of time before this would happen. Were the changes bad? Yes. Could they have been worse? Yes, definitely. Finding value post-devaluation is another discussion, but locking in the cheaper award prices now is imperative. 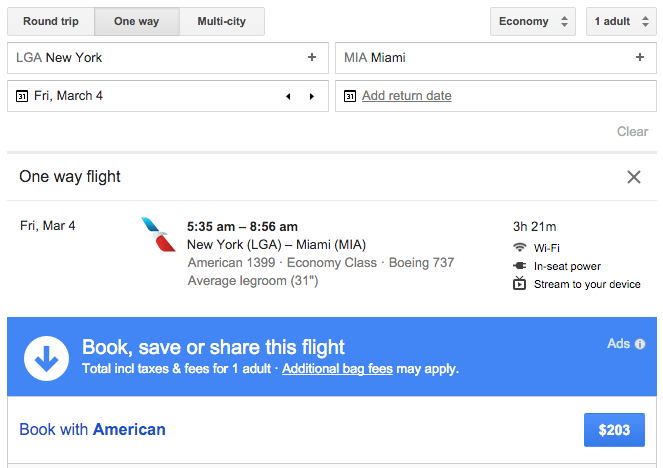 American lets you book award tickets 331 days out. 331 days from today is January 18, 2017: that covers summer and winter breaks for the next year. On March 21, 2016, you’ll have even more dates open on the calendar. You’ll be able to book until February 15, 2017. There’s a lot of red. Some green, but mostly red. The most notable decreases are in Caribbean/Mexico/Central America . For coach, that’s great, but for business or first, it wouldn’t be worth it to redeem as those flights can be short and/or the business/first class isn’t anything special on those routes, anyways. Here are some of the awards to book now that will give you a great value for your American miles, but are also going up (some more than others) on March 22. First class awards for Asia 1 and Asia 2 region. Business clash awards are going up, too, but they are more manageable. Business class on 3-class cabin flights (the transcontinental) will go up to 32.5k (vs the current 25k), but first will increase to 50,000! First class awards on partners to the Middle-East (Doha via Qatar Abu Dhabi via Etihad) will go up by 25,000 miles! 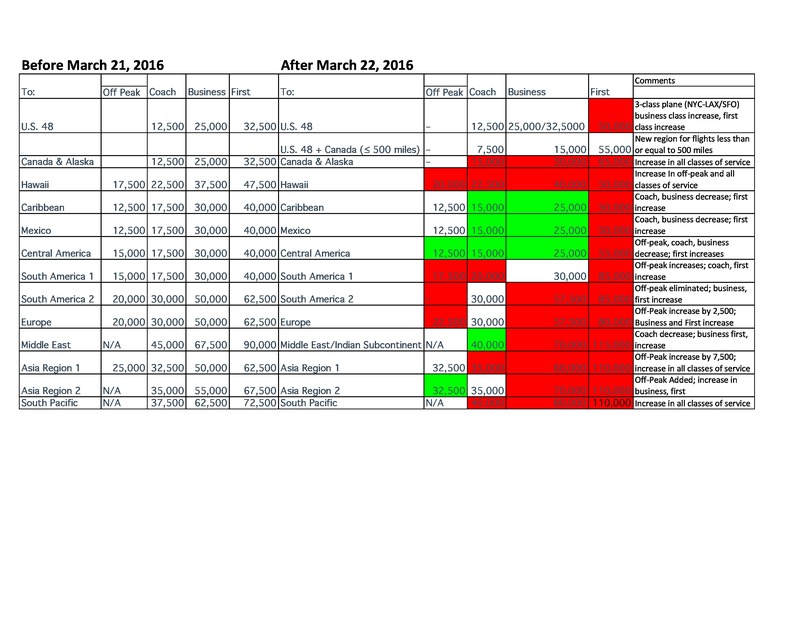 Business class awards on lie-flat routings from North America to South America 1 and 2 (Peru and Chile will increase by 7,500 miles. U Check Out Your URL.S. to the Middle-east to Australia in first or business–this will currently price out two awards, but it’s now a lot cheaper than it will be after March 22. In some cases, the amount of off-peak dates will decrease; in others, the dates will just shift around. 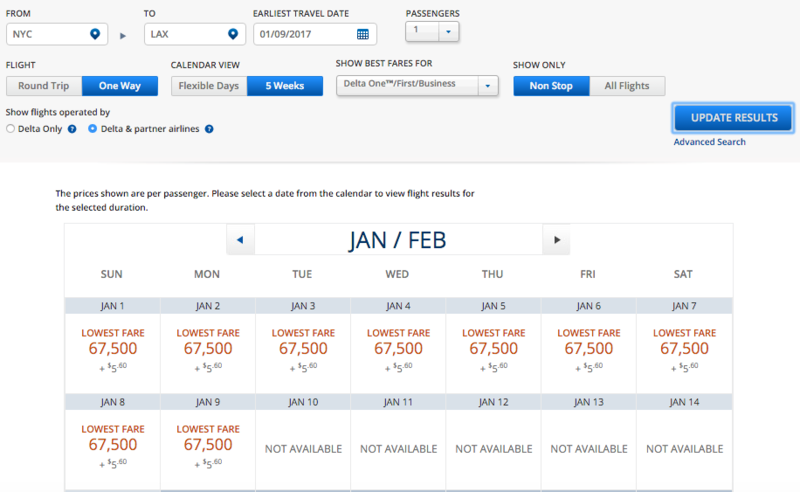 Be sure to look at those old dates here and new dates here (under ‘Details on award travel’ drop down). You can lock in awards on the old off-peak dates if you book before March 22. Being savvy, you can use this to your advantage. Let’s say that you want to go to Asia this summer, but there’s currently no availability: find a date, any date, that has the availability and make the booking. Now you keep searching and then find award availability for your summer dates after March 22, American should let you change without paying the new mileage prices and without a extra charge. Any awards you plan on booking before March 22? In about a month, we will depart on our long-awaited trip to Beijing and Tokyo. We will be in Beijing (PEK) for three nights and Tokyo (HND/NRT) for 6 nights. Though good deals can be had for hotels in Asia, why not use points? For Beijing we will be spending three nights at the Hilton DoubleTree Beijing. Though located in the business district, Ubers are relatively cheap. We’ll also only have two full days, one of which will be occupied by the Great Wall, the other occupied by the Silk Market and other must-sees in Beijing city center. 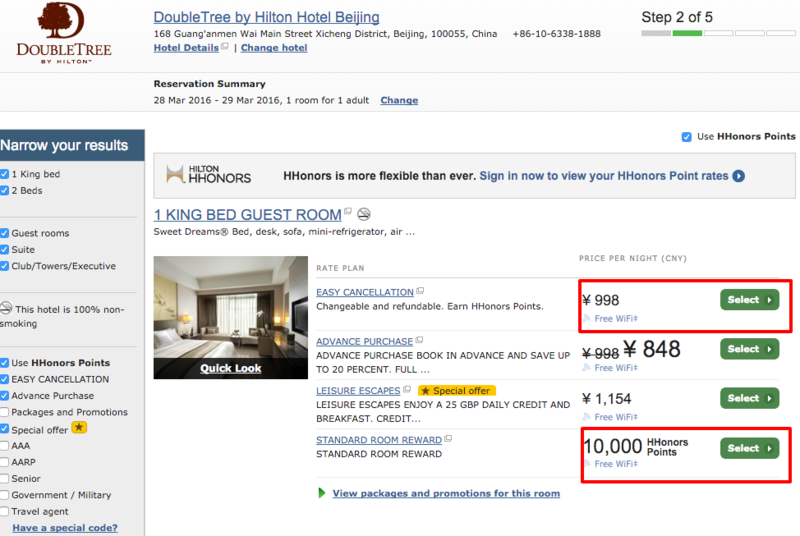 Hilton Doubletree Beijing: 10,000 HHonors points per night x 3 = 30,000 HHonors points. A low category, but get’s a 4.5/5 on Tripadvisor. And as a recently minded Hilton Diamond I’m hoping to score a suite upgrade. I earned these Hilton points with the AMEX no-fee HHonors Credit card, which has currently gone up to 70,000 points for $1,000 spent in three months. This is the highest this card has ever been. That could get you 7 nights at this Hilton! There are lots of hotel options in Tokyo. The most common ones for miles and points enthusiasts are the Park Hyatt (30,000 Hyatt points) and the Andaz Tokyo (25,000 Hyatt points). Both a great use of Ultimate Rewards points, Hyatt points, or the Hyatt credit card sign-up nights (rooms can go for upwards of $800!). The Park Hyatt Tokyo became famous in 2003’s “Lost in Translation”, where Bill Murray stayed. With no nights at the Park Hyatt available and not wanting to spend 150,000 Ultimate Rewards points at the Andaz, I looked into other options. With the options being 40,000 – 70,000, I choose the 40,000 point option. But with 117,000 points, 6 nights of staying, I’d need 240,000 points, right? Though Marriott points don’t have the greatest value and devalue (more to be discussed in the next post), this seemed like a great redemption: solid location, good reviews, and 40,000 points per night for a $386 hotel room. Marriott and Hilton have a stay 4, get 5th night free policy, even on points! So, 6 nights would cost me 200,000 points! I still needed 83,000 points, but I didn’t want to lose the award night availability. Marriott also allows you to book without enough points. You just need to be sure you have all the points in your account 14 days before you check-in. So I made my reservation, prematurely. Having already earned the sign-up of 80,000 points on the Marriott card, I signed up for the same offer for my wife. After meeting the spend and getting approved, she had 83,000 points. Marriott ALSO allows you to share points if it’ll complete the award stay! 117,000 + 83,000 = 200,000 Marriott points/6 nights, or $2,298. Not only does Marriott have these three great benefits, they’re all relatively straightforward processes. 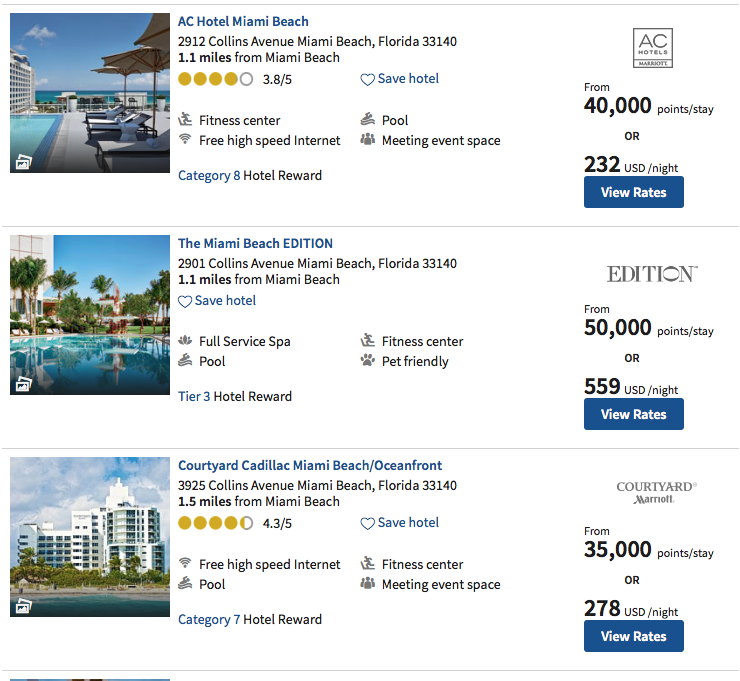 Currently, like the Hilton card, the Marriott card is at it’s highest of 80,000 points for $3,000 in spending in three months, plus an additional 7,500 points for adding an authorized user. If you and your significant other or friend both sign up for the account, after spending and adding an authorized user you’ll each have 90,500 points, or 181,000 points combined! Lots of great redemptions to be had. The highest category Marriott, category 9, is 45,000 points. With 180,000 points you’d have enough for 4 nights at the nicest Marriott hotels… wait, with the 5th night free, that would be five! Remember the new Chase churning rules. Unless it’s 1 – 2,000 points, you probably don’t want to transfer your Chase Ultimate Rewards points to Marriott. Like what you’ve read? Though you don’t have to, show your support of the site by clicking on my referral links (highlighted names of credit cards). 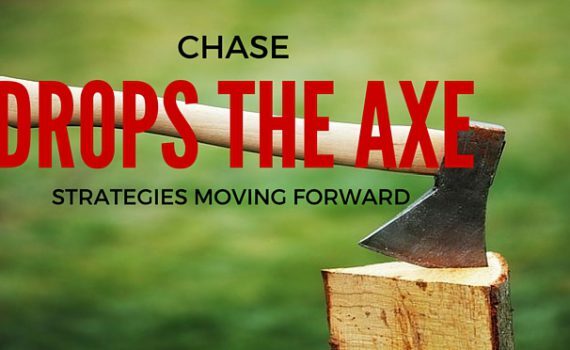 In May 2015, Chase began restricting it’s proprietary Chase products to customers who have had more than 5 cards in the period of 24 months, from any bank. At that time, co-branded (United, Hyatt, Southwest, etc.) and business cards were exempt from this rule. In late 2016, Doctor of Credit reported that in March 2016, Chase Ink business cards would fall under this restriction. Still, co-branded cards were safe. Then just last week, he reported that co-branded cards would come under the rule in April of 2016. For churners (those who open and close a lot of cards in a short period of time to earn and re-earn their bonuses), this was devastating news. Since that post, I’ve gotten a lot of questions about strategies moving forward. I thought I’d outline some scenarios. Of course, these may not work for you, but there are general patterns. Twenty-four months prior to today (2/17/16) is 2/14/14. You’ve (like me and my wife) opened up more than five cards in the past 24 months. If you can, apply for the Chase Ink business card. If you cannot, apply for any of the co-branded cards that make sense for your future travel plans. Apply for two cards (if you have good credit), as Chase will merge pulls. Be willing to close a card (not your Sapphire or Ink–otherwise you lose the ability to transfer your Ultimate Rewards to partners) or shift credit lines for approvals. Step 2: Apply in 31 days (no more than 43 days) from now for two more cards. So you’ve gotten one (or hopefully two) cards approved from the application one month ago. Apply for the next card you want/need, get approved and then apply for a second card that same day. Remember, they’ll be merged. You may not get approved, but at that point, you have nothing to lose. The last day to apply, if DoC is right, is March 31 (43 days from now). You’ve opened up 4 cards over the past 24 months, but that’s it. Apply TODAY for two cards, because once you pass that 5th card, you’ll be ineligible based on Chase’s new rules.If you do not have the Chase Sapphire, get it first. Follow the rest of the steps as Scenario A. You have 0, 1 or 2 credit cards, but after reading this, and other blogs like it, you want to get into the game. Step 1: Apply… When the offer is right, but only apply for Chase cards. I know that’s hard to swallow: Chase CAN give you a hard time if you’ve never had a card, but it’s not impossible. My first card was the Chase Slate (I don’t recommend this card, as it does not earn any rewards). Try not to apply for this. Do not apply for cards from other banks, as they will count against your total of 5. After five, move on to the other banks and rewards. This is a long-term rewards earning strategy. Note regarding apply for two cards on the same day: As long as they are within the same calendar day, pulls will be merged. However, apply for the card you actually want approved first, before applying for the second card. As I always say, what rewards you earn should be based off of your travel goals. If you fall into Scenario B or C, you can’t go wrong opening up the Chase Freedom and Sapphire card or Chase Ink Business cards, as they’ll give you the ability to transfer to partners and constantly earn Ultimate rewards. British Airways–Highest sign-up of 100,000 miles after spending $20,000 in one year from opening the card/great for medium-short haul flights in the U.S. and other intra-country destinations. IHG–Sign-up fluctuates between 60,000-80,000 points, good for two-three nights at a solid property/great card to keep every year, as you receive a certificate to be used at ANY IHG property, worldwide after paying the cheap annual fee of $49. I’ve had every Chase rewards card in the past two years except the Ink, Ritz and Fairmont. I’ll apply in that order. And for my wife, she’s already applied for the British and IHG cards. Next up on March 31? Probably Southwest cards. Part of effectively using your miles and points is not only knowing how to use them, but when to use them. Without getting too complicated, one mile can be valued, at a base level, at 1 cent. So, 100 miles is $1.00, 2000 miles is $20.00, 10,000 miles is $100.00 and 100,000 miles is $1,000. Note: This is a very, very basic valuation of points–of course, some miles are worth more, if you get more value out of a specific redemption, over others. That’s what we’ll look at here. In this example, if you’re going to pay for the ticket with cash, you’d “save” $128.00. This flight using British avoid, for example, would cost 7,500 miles, or $41.00? If those 7,500 are valued at $75.00, then you’re better off saving miles and paying cash (or that’s what I’d do). That’s 2.63 cents per mile. A great redemption, if we assume all miles are valued at 1 cent! …But, this leads us to to section B; you’re availability of miles vs. your availability of cash. This is perhaps the most common of the three categories, not because one is, “poor”, per se, but because one usually doesn’t have the extra income to take lavish trips, flying business and first class around the world and stay in five-star resorts. We fall into this category because we accrue a significant number of miles via credit card sign ups and spend smartly, allowing us to fly first and business class around the world and stay in five-star resorts. If you fall into this category, it will make sense 99% of the time to use miles, over cash to book your big and small trips. The second most common (and thus listed second), category. We earn some miles via credit card sign ups, but we’re not very aggressive. Getting free flights and hotel nights is great, but not really necessary. We’d probably take that once-in-a-lifetime trip after saving up enough miles. Short-medium hall flights to visit family and friends around the U.S. will probably be purchased using cash. If you fall into this category, you need to look at the vacation line in your budget and see when it makes sense to use miles, or cash for yourself. Without knowing each situation, you’ll get the most bang for your buck using your miles on farther destinations during peak/vacation times. We have a few credit cards, but we use cash more often than not. We buy tickets for times of the year it works for us, regardless of the cost. If you fall into this category: SPEND SMARTLY. 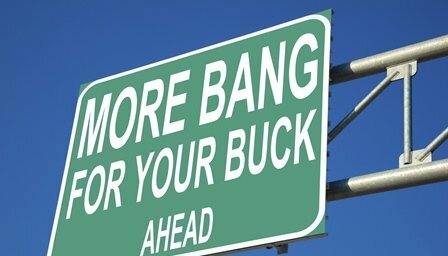 Make sure to maximize each and every purchase, for a return on investment: more miles per purchase. (Read this post for more info). Read step ‘A’, to determine the calculation of miles or cash. Then, go on to step ‘B’, to determine in which category you fall into. That can help you decide how to move forward on whether or not you should be using cash, or miles. Majority of those who collect miles via credit cards loathe Delta’s frequent flyer program, sky miles. It even earned the term SkyPesos, highlighting their lack of value (much like the Peso to other currencies, stable currencies). Let’s talk about some about some of that derision and even finding some value (if you currently have Skymiles). This post will discuss the mileage aspects of Delta and not the benefits for Elite or frequent Delta fliers. Delta removed it’s award charts, indicating that like Southwest or JetBlue, they’d go revenue based. Delta has tenuous relationships with Skyteam partners, like Korean, that impact reciprocal elite benefits and award redemptions. Delta consistently makes changes to its elite benefits and frequent flyer program without informing its members or the community. One-way, Los Angeles – Sydney, Delta business class. 175,000 miles. That would be 350,000 miles roundtrip. And it’s off season in Australia in June. 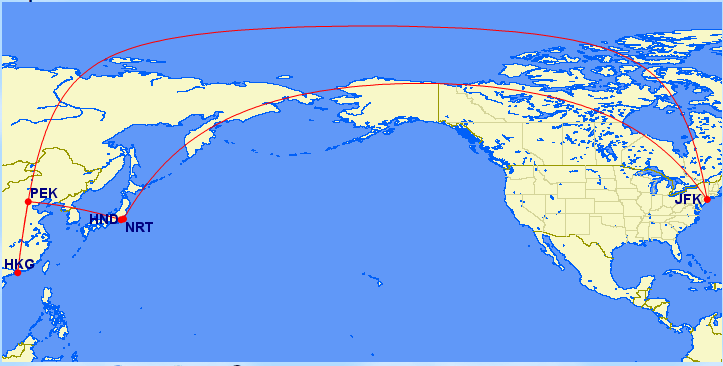 Even in the middle of October, 67,500 one-way in lie-flat from New York to Los Angeles. By comparison, United is 25,000 and American after their devaluation will be 32,500 or 50,000 in first class. 331 days from now, January 9, 2017: 67,500, one-way in business class. That’s still 115,000 miles roundtrip fora flight that clocks in at 6 hours or so. Like all airlines, the day before and after Christmas/New Years will be more miles for all routes. But the standard 12,500 one-way is there for some days. As you can see, each day and route is different. 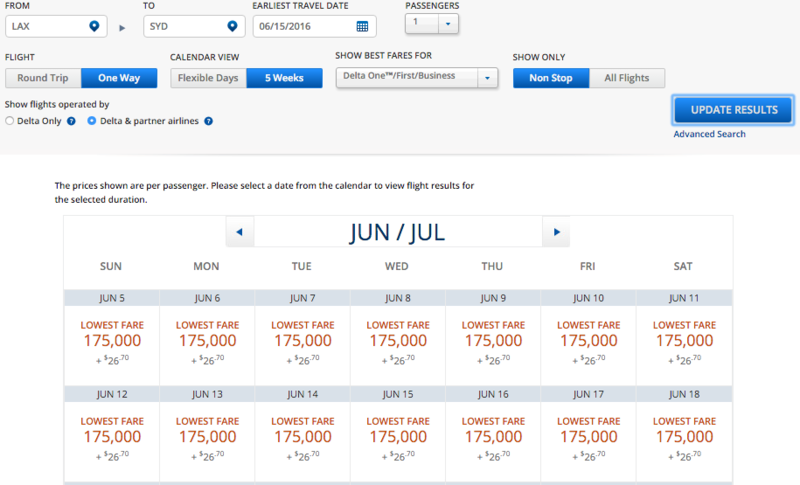 Typically, coach flights will price at the lowest level or fare class. But with Delta having removed their award charts, how is one supposed to know? Well, Dan from Dansdeals screenshotted all the award charts for all regions to give you a metric for determining how high (or low) your Delta redemption will be. You learned that saver award space on one airline will allow you to redeem miles towards an award flight on partner airlines. 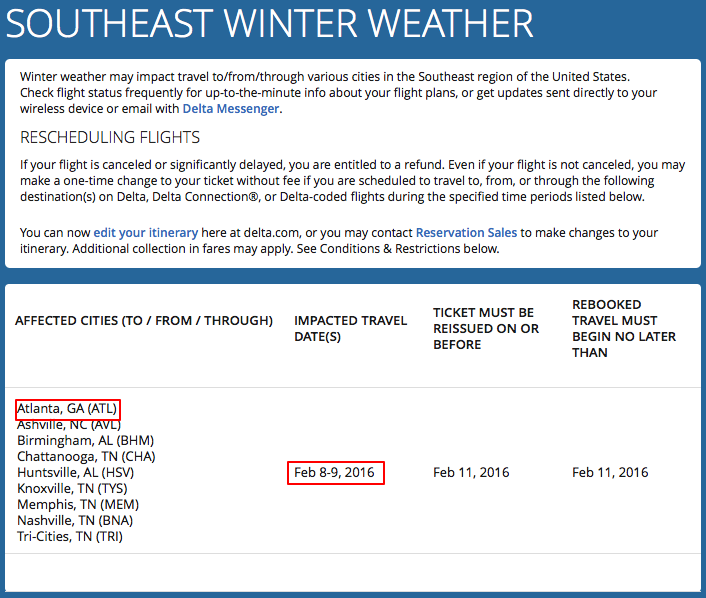 So with Delta’s revenue based flights, how do you determine if they will be bookable using partner miles? Delta flights 2829 and 427 are there… but Delta flight 472, pricing out at 32,500 miles for one-way is not showing up. Understanding and identifying that fare class will help you determine which flights are bookable using partner miles. Quick tip! Fare classes are designations on both cash and award flights that indicate where you booked the ticket and the restrictions imposed on the ticket (refundable, non-refundable, award ticket saver, coach, business, first etc). Delta fare classes ‘N’ are for economy, low level; ‘O’ for business, low level. 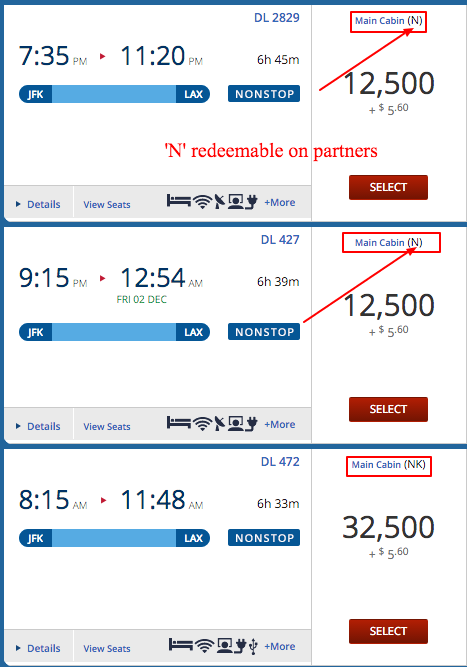 You cannot book first class partner awards using Delta miles. 62,500 one-way business class to Europe on off-peak Delta metal flights, Air France, Alitalia, and Virgin Atlantic. 80,000 one-way business class on Korean air to South Korea. 45,000 one-way economy class on Delta or Virgin Australia direct from Los Angeles to Australia. Now, taking advantage of their revenue based flights, you can score some solid deals that fall below the standard redemption rates. One good thing about Delta is their easy to read award calendar. Always search one way. To find the cheapest dates, use the flexible date option and change from one week to ‘5 weeks’. We’re always looking to get the most bang for our buck, so redeeming non saver space on any airline is usually something bloggers in this space advise against. Typically, I do as well. Except with Delta. Sometimes you can only travel during peak seasons, so all award space on the major legacy carriers will price out higher than normal. 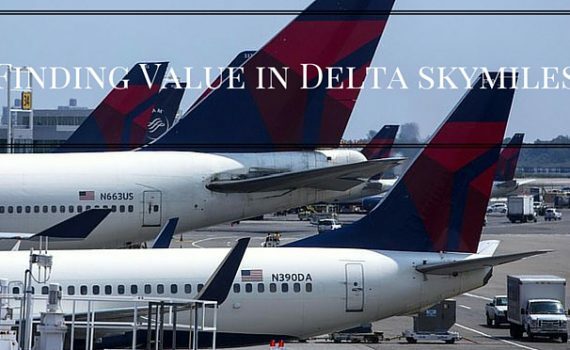 Though Delta isn’t different, their currency isn’t as highly valued so at least you’re “burning” some Skymiles and getting to where you need to get, when you need to. The best way to secure Delta’s lowest priced awards is to book in advance. As far as securing partner space, it’s like any other award booking. Be flexible. 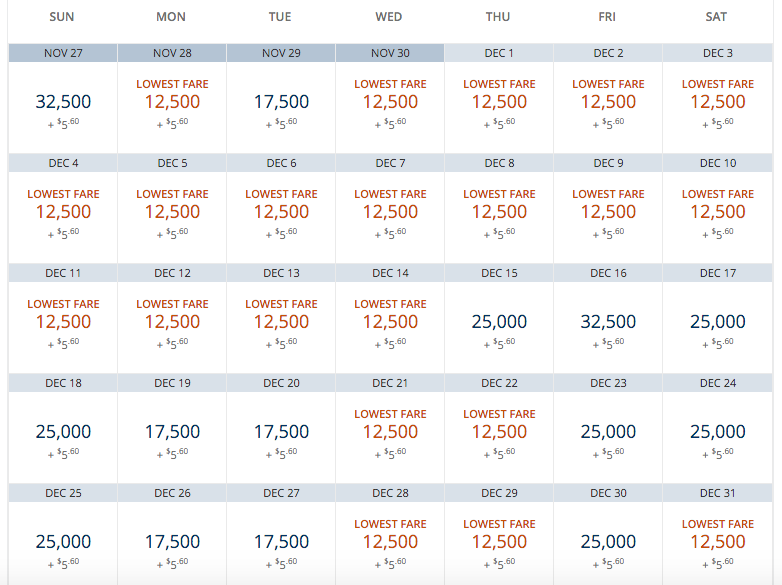 Should you go out of your way to earn Skymiles? If you have other airline cards and other AMEX cards, sure, it’s worth it. 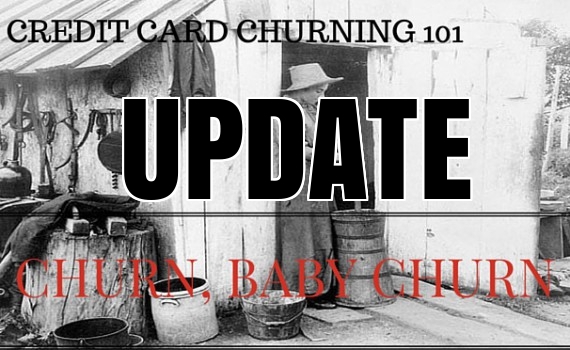 Remember to read the churning rules for AMEX to get the most out of your applications. Should you transfer to Delta? SPG and Membership Rewards transfer to Delta. But remember, transfers are only one way, so if you’re going to transfer always search award space first–transfers are instant. (As an aside, I wouldn’t transfer SPG points to Delta). Should you fly revenue on Delta? If you’re a revenue flyer, who flies enough for elite status, maybe. 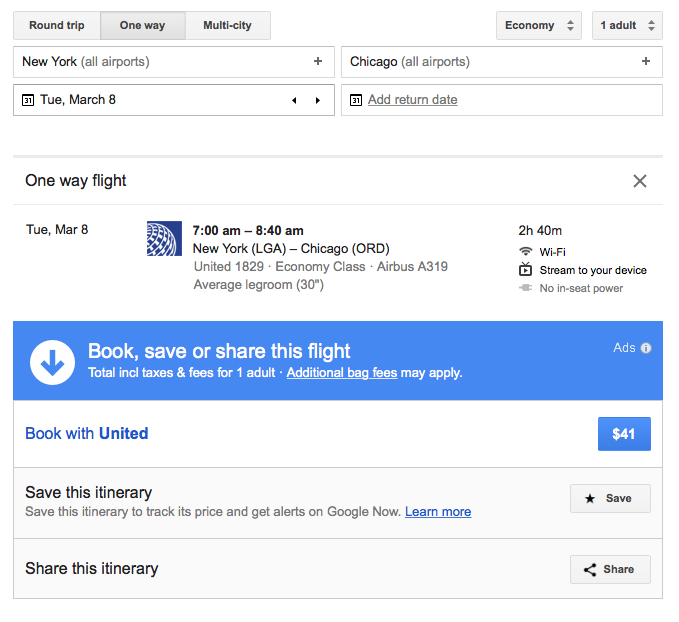 If you’re airline agnostic and you’ll go for what’s cheapest? Definitely. Delta has some of the best on-time performance. One last thing. Never use Delta miles on one-way flights from Europe. They will pass on heavy, heavy fuel surcharges. Booking in advance has helped, but also knowing that they’re getting me to where I need to get, even at the higher prices has taken some of the sting out of the lack of value Skymiles appear to have. The longer this “hobby” continues to be a “hobby”, the best deals will come and go quickly, and will be dead even faster. As more “users” occupy the market, the airlines and banks, the greatest deals will go by the wayside. The end of 2015 and early 2016 saw the death of many manufactured spend methods and further devaluations across many hotel and airline currencies. 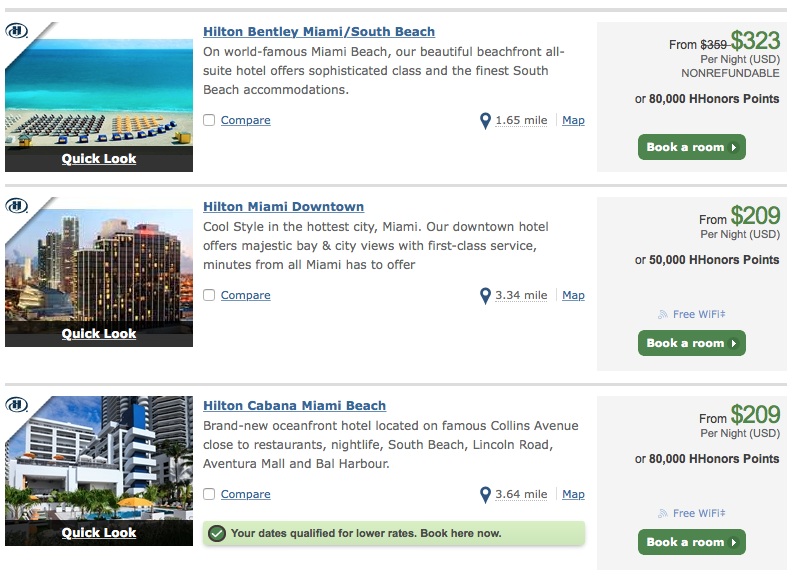 Getting the most bang for your buck and travel hacking has become more difficult. Nothing wrong with it being difficult, but sometimes there are changes that come down the pipeline that really take a chunk out of the miles and points game. 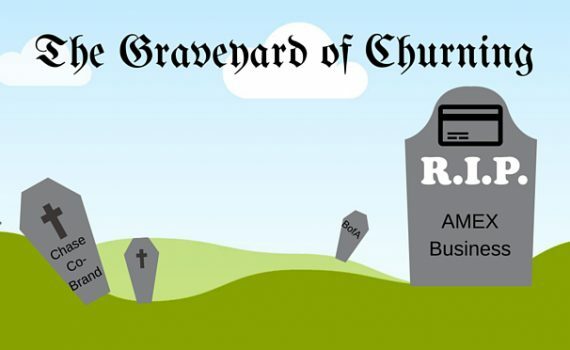 Today Doctor of Credit posted ‘Chase to Limit Card Approvals (5/24) on Co-Branded Cards‘, setting the blogospehre and private forums abuzz with the demise of churning Chase credit cards. For years, Chase has been best friend to credit card churners, with many people being able to open up 2 or 3 credit cards in a day and having as many as 8-9 cards open at one time. In the middle of 2015 they began instituting a rule that became known as ‘5/24’: If you have opened up 5 of ANY credit cards (so business, personal, all banks, even authorized user cards) in 24 months, you would not qualify for the Chase personal Flagship products: Chase Slate, Freedom, or Sapphire preferred. This was bad news, as the Sapphire Preferred used to be pretty churnable, but business cards (Ink) and the whole host of Chase’s awesome co-branded cards were safe. For now. I think we all assumed that the Ink cards would come next. About a month ago, Doctor of Credit reported that the Ink would fall under this ‘5/24’ rule starting in March. Also, bad news, but not the worst. Chase business cards are pretty difficult to get, anyways. Still, our coveted co-branded cards were safe. This morning Doctor of Credit report that co-branded cards would fall under the ‘5/24’ rule starting in April. Definitely bad news. The other notable cards include the British Airways card. I would skip the Marriott, Ritz and IHG cards. Now, you’ve probably opened up more than 1 or 2 cards if you read this blog. And if you did? Go for the Chase Sapphire Preferred. Definitely. It’ll give you the option to transfer your points to Hyatt, United and Southwest. Have a specific hotel redemption in mind at a top category Hyatt? Go for that card. Even better, if you have a partner you can spread the wealth with some of these cards. Well. I’ve definitely opened up more than five cards in the past two years. I’ve been unable to get approved for a new Sapphire since May 2015, but I’ve had success with co-branded cards. At the end of March, I will probably apply for the British Airways card (as it’s been two years since I earned the bonus) and the Ritz-Carlton card. The only other cards I’ve never had within the past two years are the Ritz and Fairmont cards. Let’s hope Doctor of Credit is wrong. For our quick trip down to Miami, I had booked an Airbnb (our first time!) for one night. We were in Miami for three nights. So what about the second and third nights? 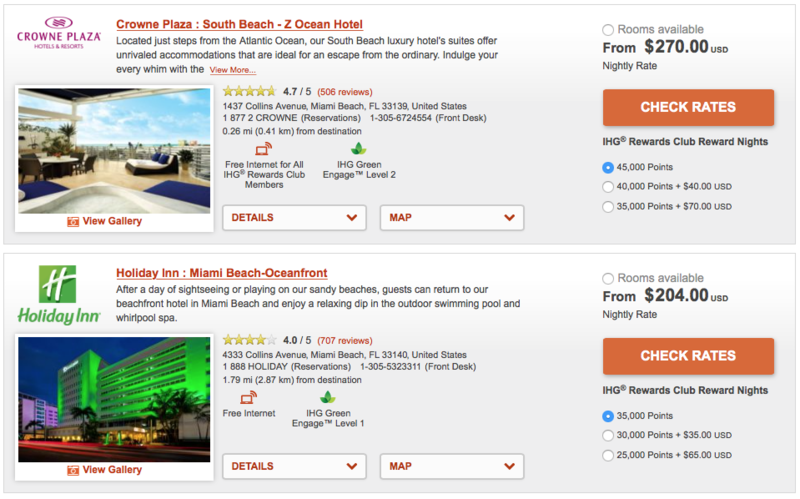 There are lots of point hotel options along the beach, but few are worth the value of the points they’re asking for. You can get better uses for 35,000 – 50,000 Marriott points, or $278, minimum ($300+ with taxes). Hilton’s an even bigger offender. You’d be better off paying than using points. And 80,000 Hilton points can get you nicer, more expensive properties. Not as many points or cash as Hilton, or Marriott, but not the cheapest, or most worthwhile, use either. Hotel Tonight to the Rescue! Stuck in a city you weren’t expecting to be? Want to take a last minute trip and don’t have enough time to plan find a hotel? 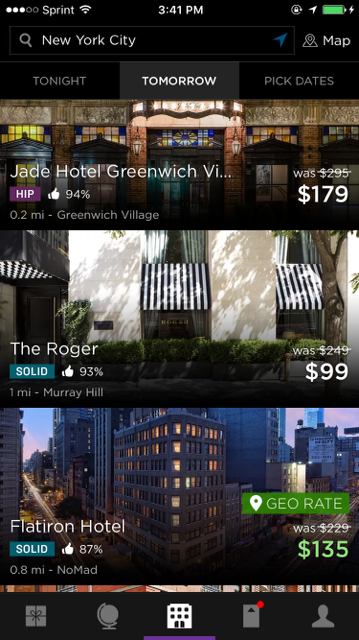 Hotel tonight is a mobile application for last minute hotel deals. Like truly last minute. And there are actually deals to be had–not the standard 20% of you can get from using random codes for hotels found online. 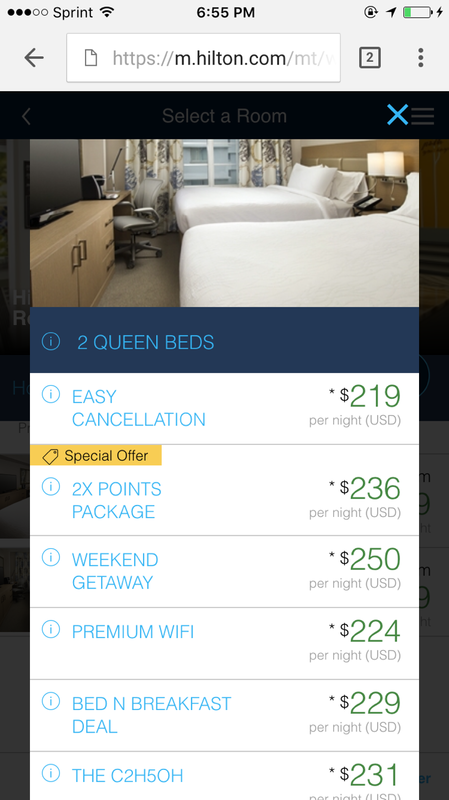 When hotels can’t sell their rooms, they release them, within a week to Hotel Tonight’s app. These are truly last minute. One of the downsides is that you don’t get room preference, earn points or stay credits on your nights, or receive your elite benefits. Hotel Tonight let’s users book for today, tomorrow, or within 7 days from the date of search. 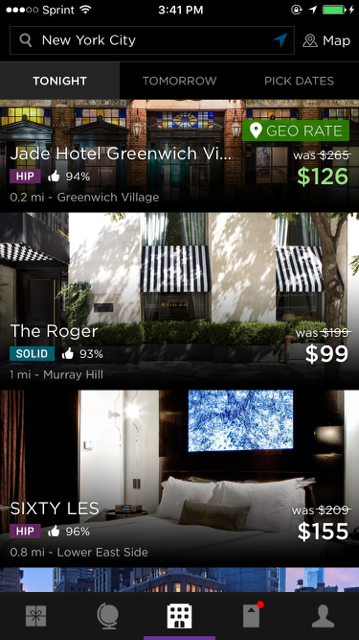 Notice in the first and second screen grabs that the Jade Hotel Greenwich Village is $53 cheaper tonight, than if you booked for tomorrow. $225 for tonight as opposed to $126! Wow! Look at that! $179 vs. $295! I’d go with Hotel Tonight. Ever since I heard about this app, I’ve wanted to try it. Sure, there’s risk involved, but I knew it wouldn’t be more expensive than websites like Priceline or Hotels.Com. On Saturday night I opened up the application and got the Hilton Garden Inn for $309 for two nights, roughly $154.50 a night! For one night, BEFORE taxes! In this case, Hotel Tonight is the winner. Will it always be this way? In the sample’s I’ve ran that include Chicago, New York City, and Los Angeles, Hotel Tonight always comes out cheaper. Is this for all cities? Before banking on Hotel Tonight, be sure to check out their list of cities. It’s very extensive in North America and Europe, with properties scattered around the Middle-East, Africa and the South Pacific (mainly Australia). So if you’re going somewhere really off the beaten track, you may want to book in advance. Even popular places like Chile and Lima aren’t available as cities, yet; but within time, I’m sure they’ll be added. That being said, if you’re staying in a chain hotel, be sure to proactively offer your Hilton, Marriott, Hyatt, etc., number, because you may receive some benefits! They do not have a website where you can book from; you can only access it via iOS or Android mobile phone app. The tablet app and website are super clunky. By adding a second night the overall price will be further discounted. Room type is not guaranteed until check-in. To be honest, it was a bit stressful, but the experience was worth it. 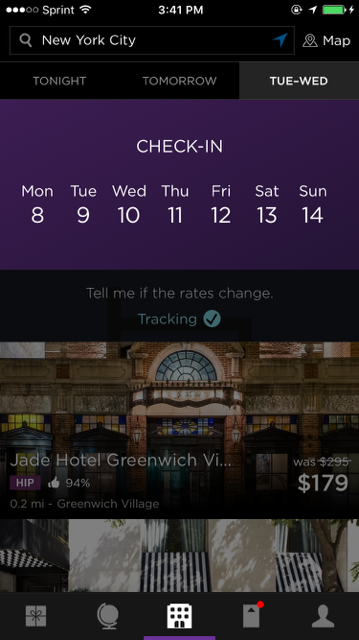 Having always wanted to try Hotel Tonight, not wanting to waste points or shell out a lot of cash, this was the perfect opportunity to try the app. Receive $25 off your first booking! Would you use the app? Or is it too last minute? This weekend, the wife and I popped on down to Miami for a quick, weekend getaway. The weather was solid while we were there, but the rest of the country has been battling storm after storm. After checking into my original flight on Sunday night, which was a 5:30 AM departure from Miami to Atlanta, connecting for 40 minutes onto New York JFK, I checked the Weather Channel app, happening upon a lot of winter weather advisories. This got me thinking: I have this less than optimal connection in Atlanta and a horribly early flight–And there was no way I’d pay that change fee. So what’s a Miner to do? ‘N’ indicates Delta’s Level 1 and ‘NS’ indicates Delta’s Level 2 award space. I redeemed at a Level 1 award, for 7,500 Skymiles. But because they were the same fare class (‘N’), I didn’t need to pay any difference. Not only did I get on a direct routing, get to wake up later for a 7:00 AM vs. 5:30 AM departure, I got an a flight that would have cost more miles. Cha-ching! 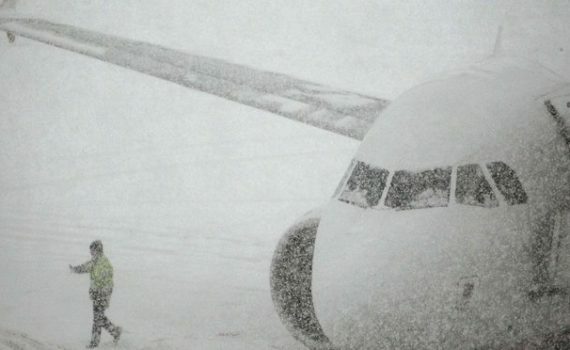 Always look for winter weather waivers to use them to your advantage, like the above. Or, more commonly, there’s a waiver issued and you can’t actually travel for other reasons–you can usually cancel the award and get your miles back.